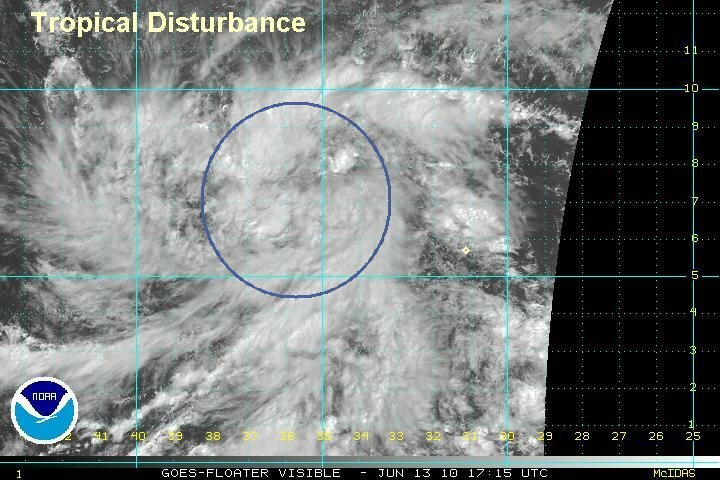 A tropical disturbance has slowly organized in the far eastern Atlantic ocean over the past two days. Satellite imagery shows deep convection increasing with winds aloft looking favorable for development. Early forecasts suggest that the low will move a little north of the Leewards by 5-6 days. 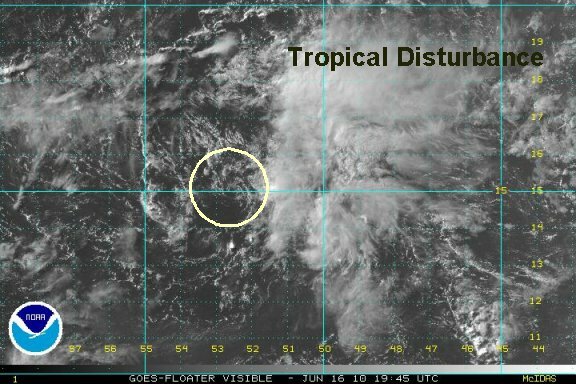 A tropical disturbance has continued to organize and it is in our opinion that it is now on the border of tropical depression status. Deep convection is most prominent on the northern side of the circulation where upper level outflow is excellent. Early forecasts suggest that the low will move a little north / near of the Leewards by Friday. 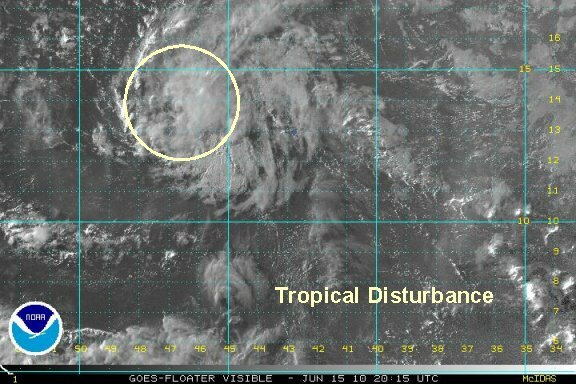 Interests in the Leeward Islands should follow the progress of this disturbance. 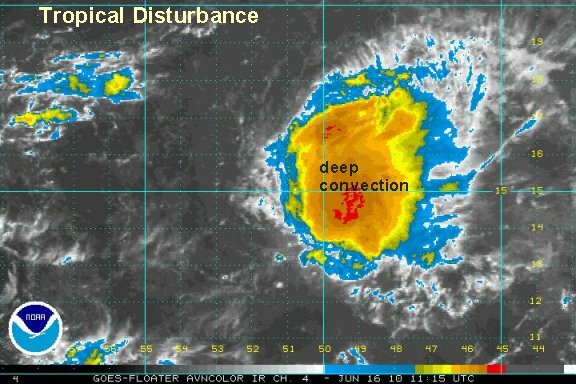 It appeared that the tropical disturbance could have reached depression status for a few hours this morning. More recently, southerly wind shear has exposed the surface low. A mid level low also seems to be placed about 50 miles north of the surface low. This is not unusual in a system struggling to get organized. Convection remains strong north of the low. This deep convection will need to rebuild over the surface low it there is going to be another chance at reorganization. Tropical weather history shows that no systems have formed this far east since the 1880's. This would be quite an unusual event if it were to develop. After looking rather ragged last evening, low 92L has gained symmetry again. The surface low center appears to be in the center of the convection. The deep convection is not quite as impressive as about a day and a half ago. Despite this, we think that the low probably now is a tropical depression. It is doubtful that NHC will call it this though. Wind shear is expected to give a more hostile environment for development by tomorrow. We call it as we see it though. 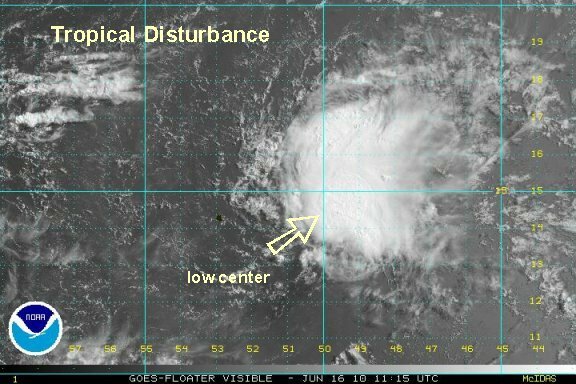 As of 8 am edt / ast the low is centered near 12.4° N / 43.5° W or about 1050 miles east of Barbados. Movement was west northwest at about 15 mph. (The low moved northwest last night and now has resumed a more wnw motion). Top sustained winds are estimated at 30 mph. Overall Low 92L has not changed much compared to this morning. Deep convection did die down for a few hours, but has rejuvenated a little again. We still believe that this is a tropical depression. Keep in mind that is doesn't take much to be classified as one. NHC has downgraded their potential for development as minimal. Again, check the stat below. 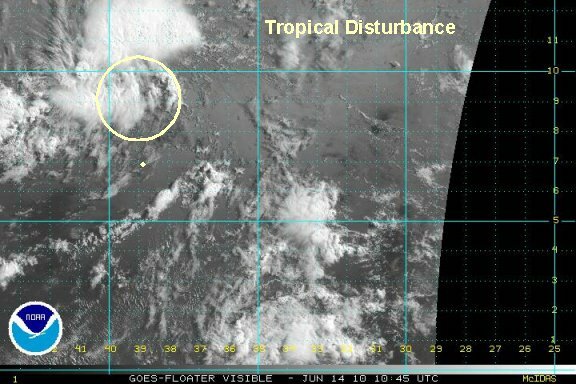 As of 5 p m edt / ast the low is centered near 13.8° N / 46.7° W or about 830 miles east of Barbados. Movement was west northwest at about 15-20 mph. Top sustained winds are estimated at 30 mph. Low 92L has had a burst of convection overnight and looks the best organized so far. Despite this, NHC is still calling this a low chance of development. Their reasoning is due to strong westerly shear. Agreed, the west southwest winds are strong now, but models indicated that this band of shear is going to lift north over the next few days possibly giving the disturbance a more favorable enviornment for a few days. As stated earlier, there is enough here for this to be classified as a tropical depression at this time. Yesterday, the models said a more hostile environment would weaken this system. This just another lesson in why forecast models can't be totally trusted. Buoys indicate seas of 5-8 feet with some waves up to 12 feet. 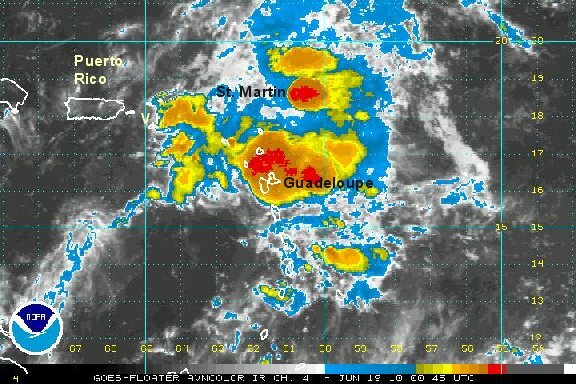 As of 7 am edt / ast the low is centered near 13.8° N / 46.7° W or about 735 miles east of Martinique. Movement was west northwest at about 15 mph. Top sustained winds are estimated at 30 mph. Forecast models are struggling to handle this tropical feature. In general, the northwest motion should contine taking the low near / just north of the Leewards by Friday and Puerto Rico by Saturday. A burst of westerly winds has moved in over the past couple of hours ripping into the deep convection. This has weakened the disturbance's organization. A more detailed updated will be posted later today. A few hours ago westerly winds aloft picked up and finally pushed the deep convection from the surface low. The forecast models finally did get the shear increase correct, but a little late. 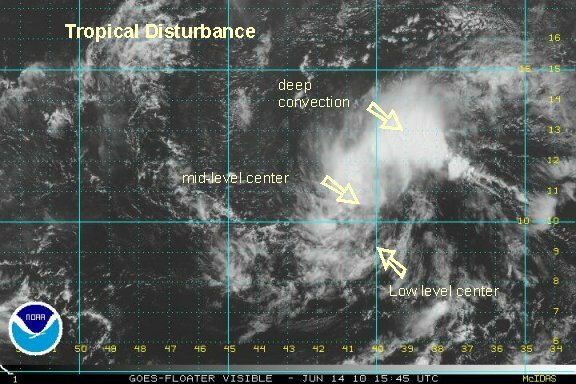 The disturbance was most likely a tropical depression for about 12-18 hours. The shear is forecast to lift away, but it may not matter. If the sufrace low outruns the deep convection, it may only remain a weak surface low. 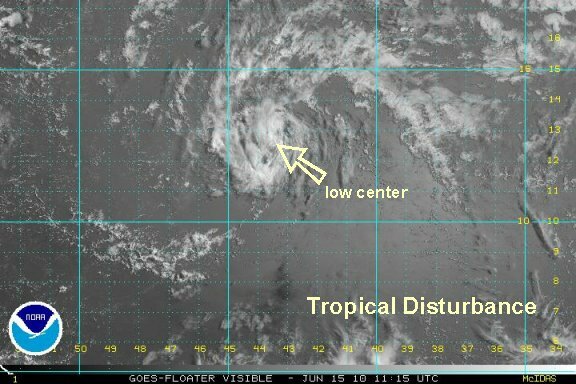 As of 4 pm edt / ast the low is centered near 15.0° N / 52.5° W or about 550 miles east of the southern Leewards. Movement was west northwest at about 15 mph. Top sustained winds are estimated at 20 mph. Forecast models take the circulation near / just north of the Leewards by Friday and Puerto Rico by Saturday. Low 92 L is a strong tropical wave that will bring heavy showers and storms to the leewards by Friday. The effecs of wind shear is clearly visible on the northern storms. The shear is a little weaker to the south where the center of the weak surface low remains. Forecasts suggested that the wind shear would decrease for a day or two to the south. This still may not be enough for regeneration. We'll keep watching. 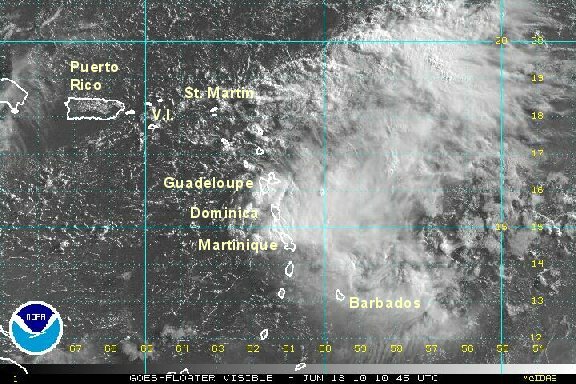 As of 8 am edt / ast the low is centered near 16° N / 57° W or about 300 miles east of Guadeloupe. Movement was west northwest at about 15 mph. It appears that the low is trying to strengthen a touch again. The close-up satellite imagery has been dropped by NOAA since they dropped this system. It looks like this very strong wave will move into the Leewards tomorrow bringing heavy showers and storms. The hurricane center has upped their chance of development from 0% to 20%. I'm guessing that they shouldn't have cancelled that closeup floater satellite imagery that fast. The cluster is undergoing a burst again. It looks like the heavy showers and storms will be moving into the Leewards late tonight into Friday. 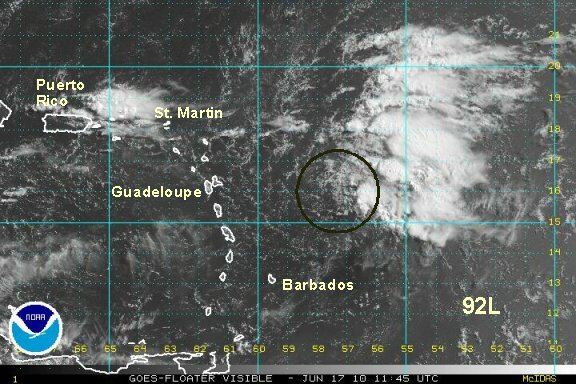 The remnants of Low 92 L are moving into the Leewards and northern Windwards. Expect overcast skies with periods of heavy showers and storms. The heaviest of the rain is near Dominica at this time. The cluster had an impressive burst overnight and is now waning. Storms will likely burst again later today. Heavy rain is moving over St. Thomas east to about Guadeloupe. There is potential for flash flooding as the squalls move though. Winds may gust to 25-30 mph. The strong tropical wave in the northeast Caribbean Saturday morning continues to bring heavy showers and storms. Winds aloft remain unfavorable for development. This will be the last update, unless development occurs.